Crown Prince Alexander never liked nobility. He didn't like the lies, the politics, or even the people he was surrounded by daily. He never wanted to be king. So when he takes his fate into his own hands and runs away, he never imagined the life ahead of him. 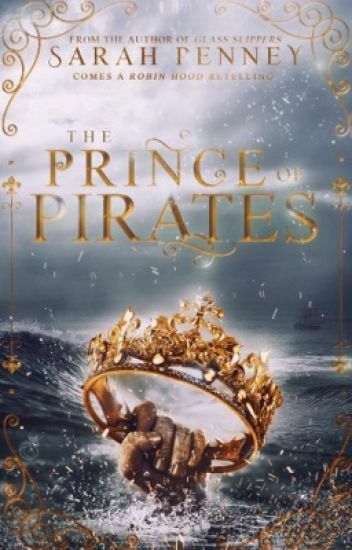 After saving a sea witch and landing on the shores of an island nation ruled by a tyrannous king, Alexander disguises himself as the pirate Alex Anton, a pirate who steals from the rich and gives to the poor. But his carefully constructed lies and way of life starts to crack as a stowaway becomes a part of his crew and he is tasked by the same king he hates to find a missing princess, the king's daughter. If he doesn't find her, he'll be killed for his actions against the king, but if he does find her, he might just find himself on the adventure of a lifetime. Between ancient sea magic, lost princesses, and disguises abound, Alex has his work cut out for him. While this is connected to Glass Slippers and A Kind of Bravery, they don't need to be read in a specific order. If you want to read this first, you can. If you want to read those stories first, you can. A young woman in a beautiful blue gown. A prince bored with his birthday ball. All is as it seems. Except for three things. One's a vampire, the other is a wizard, and they both have missions that center on the other. The problem? Only one person can walk away from their encounter alive. One of the winners from @_Once_Upon's dark fairytale prompt. Harriet has always been the type of girl who would rather ride horses than stitch embroidery, practice her sword-fighting than practice her curtsies, and she'd rather dream about being the first female knight in all of history instead of a docile wife on some nobleman's arm. When a war between the allies of Ecrivenia and the kingdom of Carigan starts to brew, Harriet begins to wonder if it might just be her chance to become the knight she's always wished to be. Taking a chance, Harriet enlists in the King's Army, disguising herself as the red-headed, slight-figured, and quick-witted boy, Harry. However, when she is put under the charge of the handsome and strict King of Marenta, Leopold, she realizes her troubles are just beginning. Not only will she have to keep the other men from noticing she is a woman, but she will also have to put up with the scrutiny of King Leopold, the best friend of her brother-in-law. Throw in grueling training sessions, whispers of treason, and the enemy's secret weapon, Harriet suddenly finds herself thrust into the reality of being a knight in a war that might not be able to be won. This is a sister novel to the first draft of Glass Slippers. The gorgeous cover is made by the amazing @solidarity_! Make sure to check her work out if you get the chance! When Princess Sophia of Carigan flees to her grandmother's house because of an assassination attempt, she thought she'd be in for a boring stay. After all, what is one supposed to do in the middle of wolf-infested woods other than cower in fear? What she didn't count on was going from being in the middle of one conflict to being in the middle of another. From the discovery of why she has never met her grandmother before, to her place in the problems of the beings that live in the forest, Sophia realizes that there is more to her life, and to her, than she knew. However, as she uncovers the secret of who cursed the forest-dwellers with mortality and becomes closer to a dangerous stranger, Sophia begins to wonder if she would've been better off not coming to the forest at all. A sister novel/sequel to Glass Slippers and A Kind of Bravery. You do not need to read either of those stories first. This is a snow white retelling with hints of little red riding hood and hamlet thrown in. Cover made by the amazing @solidarity_! All Clara wants is for her siblings to be happy, but with her stepmother constantly creating work, demanding attention, and ruining their lives, she knows this may never happen. However, when her younger brother becomes ill, there is little hope for his recovery if he continues to go without medicine or a doctor- both too expensive for Clara to hope to pay or beg her step-mother for. Trying to come up with a solution, Clara realizes that the only way to get the money they need to pay for a physician is if she marries a wealthy man, and does it soon. Luckily, news of the Prince's Birthday Celebrations soon comes to town, and Clara, with the help of her siblings and a little magic, decides to go. There is only one problem; she can never reveal who she truly is, but luckily for her, one person doesn't seem to need her to. She doesn't know who he is, what his motives are, or if he'll help her-- but she knows he is her only chance at saving her brother's life. . . even if it means being committed to a loveless marriage. Cover design made by solidarity_! This is the much edited first draft. Welcome to my graphics portfolio/shop! This is open, but it's all pretty relaxed. Feel free to take a peek inside! Thorns are wicked with barbs that ensnare and bleed those foolish enough to come too close. But their presence is often a defense, made to protect that which is lovely and delicate. Could the same not be said of a beast? "When I tell my stories, I'm not always just talking about the individual characters, I'm also talking about us- ourselves. Everyone has a potential to be any one of the characters, or even a mix of them, in their own stories. One day we may be the hero, and the next we may be the damsel in distress." "What character am I," Ylvir asked eagerly. "Oh, Ylvir," his mother said tenderly, stroking the fur around his face. "You can be whatever character you want to be... Promise me that you won't let anyone turn you into a bad guy." A short story and poetry collection. There's a mix of things in here.